OK, so having said that I would be off-line until Friday, I managed (fortuitously) to catch one lone race out of today’s action from Osaka. While standing at a bus station waiting for an eternally non-arriving bus, Ladbrokes, which happened to be directly behind the stop, was broadcasting the racing. And in my 10 minutes of downtime, it just happened to be the men’s 1500m final, so I managed to watch it and thought I’d put a few thoughts down on the race. So Bernard Lagat, Olympic Silver medallist and second fastest 1500m runner in history (a time that is 6 years old now) wins his first World title in his first international race for the USA. 1 500 m final at the World Championship Athletics 2007 in Osaka. Tarek Boukensa, Rashid Ramzi, Bernard Lagat, Antar Zerguelaine, Shedrack Kibet Korir, Asbel Kiprop. Photo by Erik van Leeuwen. IAAF rules state that once an athlete has competed for another country, he must wait 3 years before racing for the adopted country. 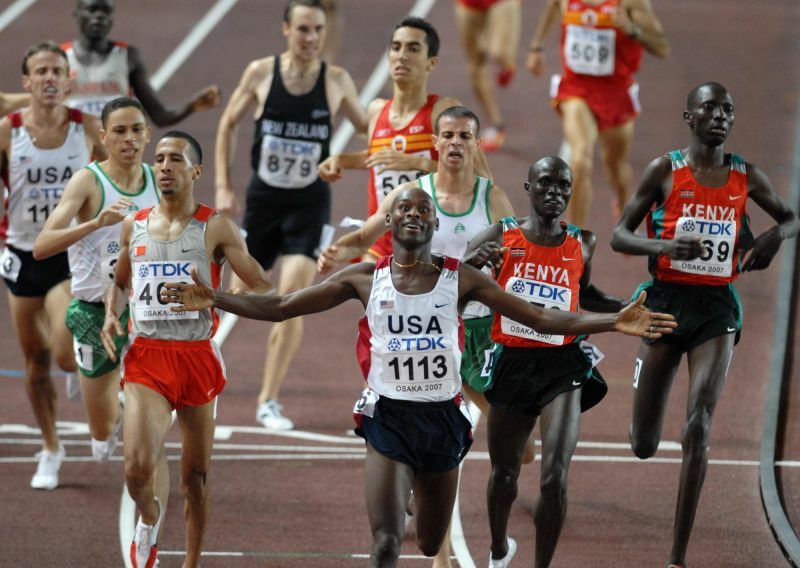 Lagat last competed for Kenya on August 24, 2004, and so became eligible to run for the USA on August 25th 2007. And not a moment too soon, as he because the USA’s first gold medal winner in a middle distance event in 99 years! The race was always going to be wide open. Apart from Lagat, who had perhaps the best HISTORICAL pedigree, there was Rashid Ramzi, defending champion (and an 800m world champ), Alan Webb (USA), the fastest in the world this year, and then of course the usual assortment of Kenyans, and Moroccans to make the race interesting. Alan Webb took up the early pace, but the pace was typical of a championship final – unspectacular and conservative. Webb has run races in the past where he has gone to the front and pulled the race out hard. Tonight, that did not happen – instead, he found himself an almost reluctant leader, and the pace was neither slow nor fast – the first 800m took around 1:58, which is much slower than the runners are accustomed to racing during the season (they are usually escorted by pacemakers in about 1:52), but a good deal faster than the super slow semi-final we saw the other night (2:08 at 800m). This is nothing unusual for a major 1500m final – the pace is usually on the slow side to begin with. But this is where things get really interesting. On the 3rd lap, when one expects things to jump into overdrive, the Kenyan Asbel Kisrop went to the front, threatened to move the race into high gear, and then…nothing happened – the third lap was run in 57 seconds, meaning that the first 1200m had passed with two leaders, neither of whom really did anything decisive for the race. Typically, that third lap is where the pace comes down into the 55 second range, but this was different. The result was that with 300m to go, the entire field was still bunched, whereas usually, the acceleration trims the contenders down to about 4 or 5. Of course, taking the lead out in a World Champs final is an exceedingly difficult prospect – the temptation is to slow it down, refuse to do the work and thus save energy for what all the athletes know will be a furious final 300m. The alternative, pushing hard from the front, is often ‘suicidal’, because all it does is set the race up for those coming from behind. So Webb can hardly be blamed for not pushing any harder – he did what he could and running from the front is the way he chose to go, to his credit. But tonight’s race really lacked a ‘boss’. This is, in my opinion, good for the race. In the past, we’ve seen one athlete dominate the race, even using team-mates as pace-setters in a final, but this was a pure race. At the sound of the bell, the entire field was lurking for what promised to be a vicious kick, but…nothing happened. The next 100m (between 1100 and 1200m) were covered in about 14 seconds (hardly a last lap explosion), and down the back straight, it still seemed that no one had done anything decisive. But it was over the final 200m that things unfolded. The final 300m, for what it’s worth, were covered in about 39 seconds, but the running only started at the 200m mark. And it was Lagat who ran the smartest race of all. The biggest loser in the tactical stakes was Ramzi, who perhaps took a leaf from the Medhi Baala book of 1500m tactics, as he was utterly boxed in over the final bend. His mistake came with about 250m to go, when Lagat moved forward, and he had a clear opportunity to move wide. But for whatever reason, he stayed where he was, and with the race having been so cagey up to that point, he was soon passed by about 4 or 5 athletes, making their own bids for glory. And so coming off the final bend, with 90 m to go, Lagat found himself with clear air and an open track, whereas Ramzi was walled in by two Kenyans, Webb and Lagat. With nowhere to go, Ramzi threw what looked like a side-step that would have made Christian Cullen proud (Emmet Smith, for the USA readers – Cullen is a rugby player!) and tried in vain to catch a speeding Lagat. But it was too late, Lagat was too strong and won comfortably in the end, a deserving victor, both for his tactical acumen and his clearly superior speed. Perhaps, on another day, Ramzi might have been closer, but he either didn’t have a legs down the back straight, or he lost concentration – either costs world titles, as he discovered. So, Lagat breaks a 99 year streak for the USA. The next gold might not be so long in coming, because Lagat will line up in the 5000m event later this week, and with the kind of speed we saw today, he has a great chance. I’ll preview that race in much more detail later in the week, because like the men’s 10 000m final, it offers up a fascinating contest between a speed merchant and the 5000m ‘regulars’, who will have to do something to negate that finishing speed. So that’s all from today – I would want to watch the other races before commenting on them, but that will have to wait. Join us later in the week for the 5000m preview, and a wrap from other races and events from Osaka!